On 4 September, ITEA 3 Call 5 opened with the ITEA PO Days 2018 in Stockholm. 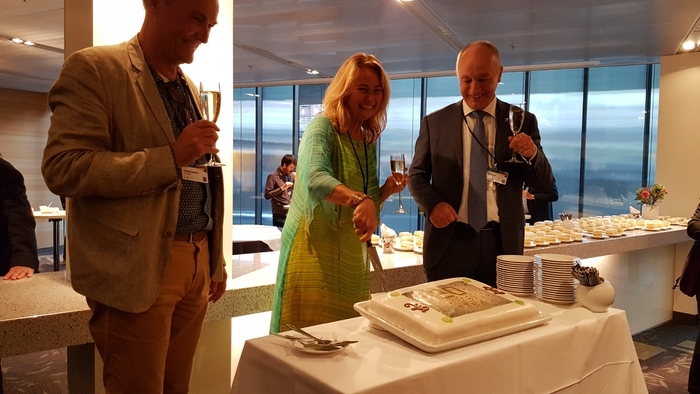 During this festive edition of the event, the ITEA Community both celebrated 20 years of impactful innovation and looked to the future with the presentation of 61 new project ideas. Nearly 300 participants from 13 countries participated in this lively 2-day brokerage event. Most participants came from the host country Sweden, followed by Turkey, the Netherlands and Germany. For the fourth time in a row we welcomed a Canadian delegation to the event. On Tuesday, 54 project ideas were presented as a poster and 44 ideas were pitched during the parallel pitch sessions. The following brainstorm sessions resulted in 20 final project ideas presented during (one of) the closing sessions of each day. As ITEA was officially labelled as a EUREKA Cluster in October 1998, these PO Days were an excellent opportunity for the ITEA Community to celebrate ITEA’s 20 years of impact in Software Innovation. ITEA Chairwoman Zeynep Sarılar kicked off the celebrations by presenting an ITEA timeline with special milestones. As impact is one of the core values in ITEA, Zeynep also introduced the addition of 7 new inspiring stories to the ITEA Impact stream, which will keep on growing over time with impactful ITEA project stories. For 20 years, ITEA’s project impact has been achieved by a growing Community of close to 1600 partners from large industry, SMEs, universities, research institutes and user organisations in 32 countries worldwide. As ITEA would not have existed without its valuable Community and its strong projects, we invited our Community members to share their ITEA experiences in a short personal video message. A collage video of these heart-warming messages was shown at the end of Zeynep’s speech. The celebratory evening ended with a social gathering with cake and champagne. Nearly 40% of the attendees took the effort to evaluate the event and share their thoughts and suggestions with the ITEA Office. With a 4.12 on a 5-point scale, this year’s event was evaluated as the best PO Day event ever. Overall, there was a very positive vibe during the event. Among the highlights were the set up of the programme, the quality of the plenary presentation, also the newly introduced sessions for Public Authorities, the venue (Stockholm Waterfront Congress Centre) and the location (Stockholm). The organisation of these PO Days was strongly supported by VINNOVA, the Swedish Governmental Agency for Innovation Systems, for which we are very grateful. Even during the PO Days event, the first 5 Project Outlines for ITEA 3 Call 5 were already shaped. At the deadline of 30 October, 23 Project Outlines were submitted. Currently, all these Project Outlines are being reviewed. On 3 December the projects will be informed whether they will be invited to submit a Full Project Proposal.